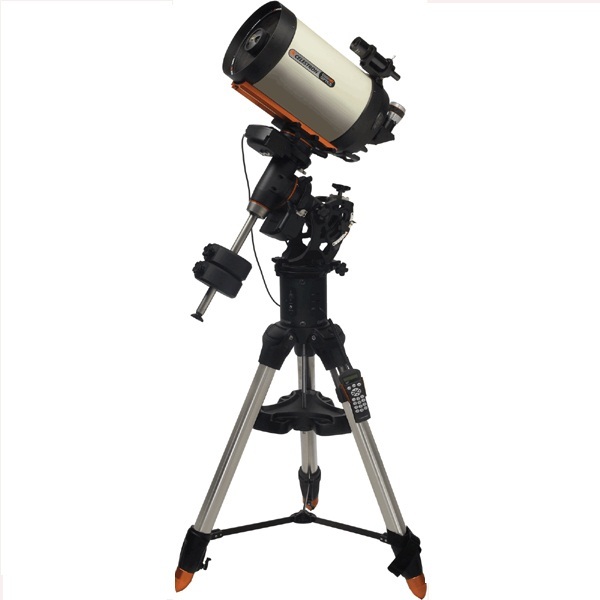 The CGE Pro 1100 HD combines Celestron's state of the art CGE Pro Computerized Equatorial mount with its new EdgeHD optical system. With an optical tube assembly weighing only 28 lbs, this telescope is still portable enough to be taken to dark skies, and has 89% more light gathering power than an 8" telescope and 40% more than the 9.25". For astrophotography, the German Equatorial mount offers easier balancing, unlimited space at the rear of the telescope tube to mount a camera, and whole sky access. Now you can enjoy all of the NexStar software and database features with the extra stability and portability of a German Equatorial mount. Some companies boast that their telescopes give diffraction limited stars in the very center of the field of view. EdgeHD optics not only produce diffraction limited stars on axis, but maintain diffraction limited stars across the entire field of view of many of the most popular astrophotography cameras. Even at the very edge of a full frame camera chip, the EdgeHD 11" delivers stars of less than 2 arc seconds. The EdgeHD 11" optics produce a focal plane three-times flatter than the standard equivalent SCT telescope with diffraction limited stars beyond the entire SBIG STL4020CM field of view! Tube Vents - Each vent has an integrated 60 micron micro-mesh filter allowing hot air to be released from behind the primary mirror. Axiom Eyepiece - EdgeHD 11" optical tubes come with Celestron's top of the line Axiom eyepiece. With a 23 mm focal length and 82° AFOV, you get an incredible combination of power and wide field of view. Plus each Axiom eyepiece is optimized to deliver pinpoint images when used with a flat field telescope. Increased Payload Capacity - With a maximum payload of 90 lbs, the CGE Pro mount is able to hold the 11" telescope more securely even when fully loaded with all your imaging gear. All-Star Polar Alignment - Choose any bright alignment star for a software assisted alignment of the mount's polar axis that will have you ready for imaging even if you can't see the North Star. No-Tool Polar Alignment - Larger hand knobs for both Altitude and Azimuth adjustments. Meridian Tracking - Extended tracking past the Meridian of up to 20 degrees of uninterrupted imaging through the best part of the sky. Faster Slew Speed - Improved gearing and motors provide faster slew speeds than ever before with a maximum slew rate of over 5°/per second. Accuracy - The hallmark of any telescope mount is its ability to find, center and track celestial objects with the highest degree of accuracy. Pointing - With just a standard hand control alignment, CGE Pro has the ability to center a star in your eyepiece or CCD chip to within 5 arc minutes. Using NexStar's advanced pointing features such as Calibration Stars, Sync and Precise GoTo, further improves the pointing accuracy to as low as 1 arc minute in the desired region of the sky.